CAMDEN, NJ—East Camden resident Maritza Camacho said that her and her family would travel to Cooper River Park in Pennsauken to enjoy the outdoors together rather than crossing the street to Alberta Woods Park because she felt it was unsafe. Now, after a $775,000 renovation from Camden County, Alberta Woods Park is once again a “neighborhood park to enjoy together as a family,” Camacho said. 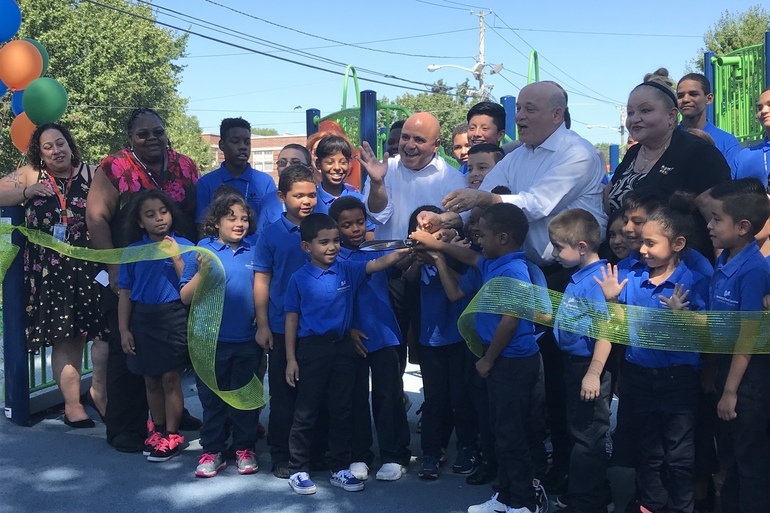 On Wednesday, county and city officials were joined by the park’s neighbors and students from the neighborhood’s Mastery McGraw Elementary School to unveil the transformation of a park once blighted by crime and debris to a bright and brand new open space. The project, completed in conjunction with the City of Camden and Cooper’s Ferry Partnership, is part of the Camden County’s $5 million revitalization effort to upgrade and improve four Camden parks that also include Fourth and Washington, Whitman Park and Reverend Evers Park. Construction on the park began in April, and took four months to complete. Students, parents, teachers and staff from Mastery McGraw Elementary School were an integral part of the planning and design of the new park, said Mayor Frank Moran. Improvements to the park included a new, expanded playground and spraygroud, an irrigated lawn, a stage for outdoor performances, a walking loop around the park and new picnic tables, benches and lighting. Dwaine Williams, who has lived across the street from the park to see it undergo three renovations, said it’s going to take the neighborhood working together to make sure the park is preserved for families. “Will people vandalize this park? Absolutely. There’s going to have to be some good oversight, quick response for maintenance in upgrades,” Williams said. The Barkley Street resident, who at one point in previous years volunteered to open and close the park, said that in the past people have used the park to drink or ride ATVs and other off-road vehicles through it.